But suddenly the Mirror went altogether dark, as dark as if a hole had opened in the world of sight, and Frodo looked into emptiness. In the black abyss there appeared a single Eye that slowly grew, until it filled nearly all the Mirror. So terrible was it that Frodo stood rooted, unable to cry out or to withdraw his gaze. The Eye was rimmed with fire, but was itself glazed, yellow as a cat's, watchful and intent, and the black slit of its pupil opened on a pit, a window into nothing. Despite the description, the Eye was only perceived by very few people in Middle-Earth, and did not have a physical worldly form, unlike Sauron. In The Hobbit: The Desolation of Smaug, the pupil of the great eye is shown to be the fiery silhouette of Sauron. No - that's Peter Jackson's imagination at work a little bit too much, giving an overly simplistic and overly literal interpretation of things (although - perhaps understandably - it works well enough in the cinematic medium). Here is a excerpt from an interview given by Michael Sragow of the Baltimore Sun with Peter Jackson. It was printed in a syndicated newspaper at 2001-12-19. Q: As you were adapting the book, did you try to introduce at least two key elements of the plot simultaneously? A: I certainly didn't want to fall into the trap of making the film too stately and too staid. The novel, for all its wonderfulness, is renowned among those readers who don't enjoy it as being dense and overly complicated and even ponderous. I wanted to give the movie a dynamic energy and a sense of momentum. It's a big story, but also a great story with good characters — and not all are apparent at first reading. What's ultimately interesting about “The Lord of the Rings” is the villainy. Sauron is the ultimate dark lord figure, but you never see him — he takes the form of a flaming eyeball. And you know it's not going to be interesting to see, oh, Arnold Schwarzenegger square off against a flaming eyeball in the climax. The betrayer–wizard Saruman is a useful secondary villain, but he stays in his dark tower in this movie [i.e. “The Fellowship of the Ring”] and doesn't leave. We came to the realization, which is obvious, really, that the ring is the villain of the film. I treated the ring less as an object or prop and more as a potent character. Going from that single quote, we could suppose that PJ genuinely thought that the Eye of Sauron was Sauron's physical form. There is also http://www.glyphweb.com/arda/faq/sauronshape.html which does not quote PJ but does express a similar assessment. He has only four (fingers) on the Black Hand, but they are enough. So he's clearly got a hand for starters. ...the year 1000 of the Third Age, when the shadow of Sauron began first to grow again to new shape. Confirms that there is a physical form but no indication of what it is. Sauron should be thought of as very terrible. The form that he took was that of a man of more than human stature, but not gigantic. Most telling of all, a description of his actual form. So it's quite clear that Sauron's physical form is that of a tall man. As a Maia he was once, of course, able to take essentially any form he wished (and see Of Beren and Luthien for a description of him doing so, as well as his appearances among the elves as Annatar) but he lost much of that ability at the end of the Second Age. I know there are other more complete answers posted above about Sauron's physical form, but some may not be aware that Tolkien himself painted an image of Sauron, the only one he ever made. 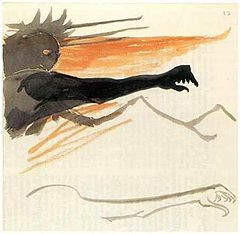 This is only a rough "first draft/concept" as it were, showing Sauron reaching out with the mountains of Mordor in the background, as he seems to appear to Aragorn and his forces at the conclusion of the battle of the Black Gate, before the west wind sweeps him away after the Ring is destroyed. And as the Captains gazed south to the Land of Mordor, it seemed to them that, black against the pall of cloud, there rose a huge shape of shadow, impenetrable, lightning-crowned, filling all the sky. Enormous it reared above the world, and stretched out towards them a vast threatening hand, terrible but impotent: for even as it leaned over them, a great wind took it, and it was all blown away, and passed; and then a hush fell. It can't be known now whether he ever planned to revisit this and make a more complete version of the Dark Lord. I always had the impress that the eye of Sauron may be the palantir that Sauron used, or a a projection of it. Sauron had to have a physical form in order to use the ring of power. Not sure if it's in the Hobbit or LotR, but when you see Sauron revealed in human form, as a dark/shadow figure, in the midst of flame, when the camera pans back, the dark figure looks like a cat's eye pupil in a flaming eye, which pans back to the eye of the dark figure, rinse and repeat. So I'm not sure that the "eye" is actually a giant physical eye, as much as something that resembles an eye. In The Silmarillion Tolkien says that his body was lost in The War of the Last Alliance and that "the Eye of Sauron the Terrible few could endure" even before that loss of physical form.
" The spirit of Sauron endured" Gandalf says at the start of the Fellowship of the Ring. In other words, his body was destroyed by Isildur but his spirit endured as the One Ring endured hence why he appeared as a Great Eye. As Saruman suggested " He cannot yet take physical form" which suggested Sauron needed the One Ring to take physical form again as he had been destroyed physically when he lost it hence why he was desperate to find it. I think he had a phisical form in the time of lotr, but I think he didn't have magical powers and excellent skillz without the ring in his hand. That's my only reason, that is the only reason he didn't kill the hobbits himself in his land. How can an eyeball control an army? Why didn't Sauron signal the Orcs that Frodo and Sam were at Mount Doom? 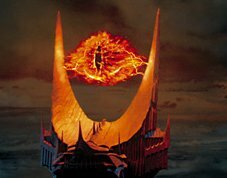 In the end of LOTR, why does the Eye of Sauron burn so vigorously after the Ring gets destroyed? Are there any other Wraiths, Wights and Ghosts? Who actually defeated Sauron in the War of the Last Alliance?